Find out more about your park network across Milton Keynes. You can explore each park using our interactive map. Explore this section and find out more about the different activities you can enjoy across the parks such as running, orienteering, BBQs and more. We're an independent charity that cares for many of Milton Keynes parks and green spaces. This adds up to 6,000 acres of river valleys, woodlands, lakesides, parks and landscaped areas alongside the main roads. Explore this section and find out about becoming a volunteer, holding an event, holding a licensed activity, signing up for our newsletter and much more. This event is in the past. This page is for information purposes only. This trail in the trees maxes out at 9 feet high, making it the perfect place to start for the younger or more nervous adventurers out there. Sessions last 35 minutes on average, anyone at least 1.1m tall and 6 years old can give it a go! Willen Lake is Milton Keynes’ most popular park. 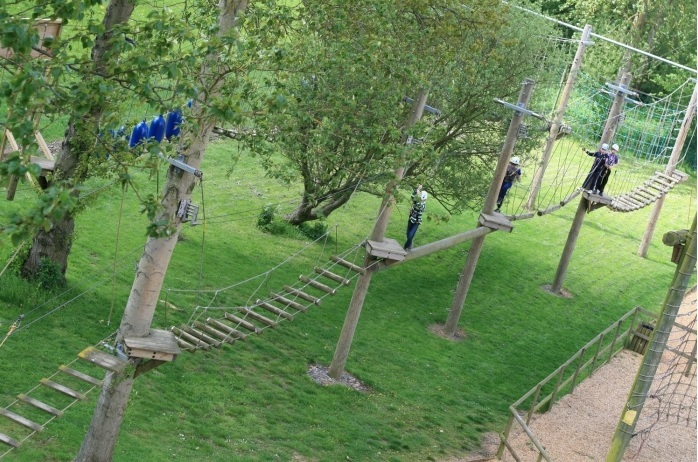 Visitors take part in watersports activities, go cycling, enjoy the playground, try the high ropes course or simply picnic along Willen’s shores. It’s a great place to entertain all ages of family and friends, whether it’s a visit to the café or restaurant, a stroll, trying a beginners’ course in sailing or hiring a pedalo or bike. The one4six café and The Lakeside Pub operated by Fayre and Square. Maybe you’ve lived in Milton Keynes a long time or maybe you are new to our unique city, but do you know about The Parks Trust? Over 450 events and activities were held in our parks in 2018. Our team gives permission for many different operators to use our green spaces, from large festivals to charity runs, fitness bootcamps to professional filming. MK Playday have been successfully shortlisted in applying for the Tesco Bags of Help Grant Scheme. The MK Playday project will be put forward to a customer vote in Tesco stores during May and June 2019.